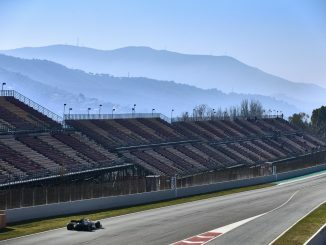 HomeF1What will the 2019 Formula 1 grid look like? Formula 1’s annual silly season is in full swing! As the teams take a break between the Hungarian Grand Prix and Belgian Grand Prix, speculation about next year’s driver lineup is building. With Daniel Ricciardo’s immediate future now confirmed, it seems there’s going to be plenty of changes to be announced in the coming months. Just six drivers know which team they’ll be racing for in 2019, and only two teams have filled both of their race seats ahead of the summer break. 3Legs4Wheels takes a look at the rumours and tries to figure out which drivers will be in which cars next year. The reigning world champions are at the top of this year’s drivers and constructors standings, so it was probably quite an easy decision for them to stick with their current lineup, announcing a two-year deal for Lewis Hamilton and one-year extension for Valtteri Bottas ahead of the Germany Grand Prix. The new deals made Mercedes the first team to confirm their 2019 lineup. I’m very proud to be part of this amazing team. I can’t wait to see what the future holds. I will keep giving my 100% for our goals. Hard work always pays off! Mercedes could still have a big role to play in the drivers market though. Force India’s Esteban Ocon remains part of Mercedes’s driver program, while F2 championship leader George Russell is also part of the Mercedes family. 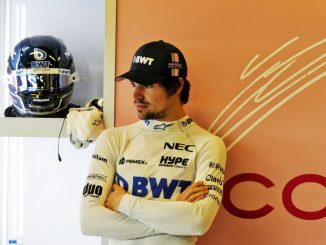 Force India’s immediate future is still uncertain, which could mean Ocon needs a new home for 2019, while Russell will also need a new challenge if he wins the F2 title as champions can’t return to the F1 feeder series. Russell impressed during the recent test at Hungary, setting a new track record, so will be hoping to make a step up next year if he wins the title. Sebastian Vettel is under contract with Ferrari until 2020, but teammate Kimi Raikkonen is out of contact at the end of the current season. The Finn has been driving well this season, sitting third in the championship with six podiums, but he hasn’t won a race since 2013 – prior to his return to the Italian team. While Raikkonen’s performances have been consistent in 2018, the debut season of Ferrari driver academy product Charles Leclerc is thought to have caught the eye of the bosses at Ferrari. Last year’s F2 champion has impressed at Sauber, outperforming more experienced teammate Marcus Ericsson and securing five points finishes, including a sixth place in Azerbaijan. Leclerc had been hotly tipped to oust Raikkonen prior to the death of Ferrari president Sergio Marchionne, but it’s now thought the new management structure want to stick with Raikkonen for another year, giving the young Monegasque driver another year before moving him into a Ferrari race seat. Daniel Ricciardo is departing Red Bull at the end of the season to join Renault, leaving Red Bull looking for a new teammate for Max Verstappen, who has a deal for the next two years. 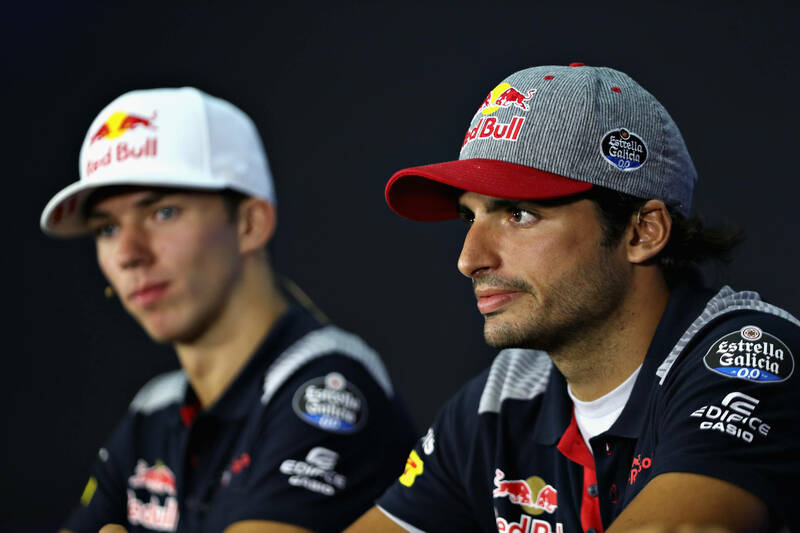 Two drivers have emerged as favourites to replace the Australian – Carlos Sainz and Pierre Gasly. Sainz will definitely be looking for a new drive as Ricciardo is taking his spot at Renault. The Spaniard is still part of Red Bull’s setup though, as he’s only on loan at Renault so could be recalled for 2019. 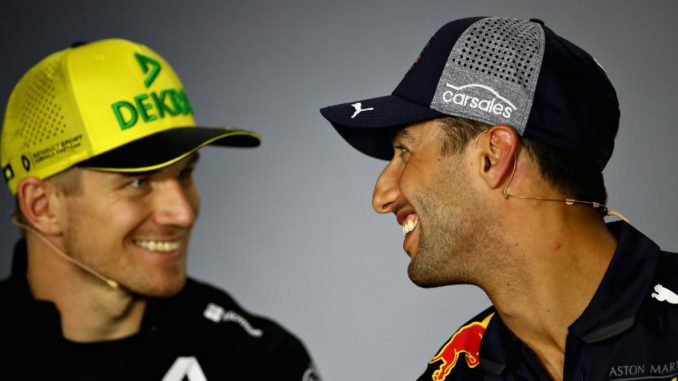 However, he had a fraught relationship with Verstappen when the duo were teammates at Toro Rosso, while current teammate Nico Hulkenberg has almost twice as many points as Sainz this season. Red Bull might prefer to go with Pierre Gasly, who has just four points fewer than Sainz this year, which is the Frenchman’s first full season in F1. He’s also has a year using the Honda power unit, which Red Bull will be using from 2019, which could work in his favour. Red Bull have insisted they aren’t in a hurry to name Ricciardo’s replacement, and will assess all the options before making an announcement. Renault said they were coming back into F1 to win titles, and they appear to have backed that up by signing Daniel Ricciardo for the next two years. The team confirmed the seven-time Grand Prix winner will line up alongside Hulkenberg in 2019, making them the second team to fill both seats for 2019. Ocon had also been linked with Renault, while Ricciardo’s arrival means Sainz will be moving on at the end of 2018. Force India have the least certain future of any team on the grid right now. Sergio Perez filed to place the outfit in administration ahead of the Hungarian Grand Prix, meaning a buyer is currently being sought for the team. One of the potential buyers is Canadian businessman Lawrence Stroll – the father of Williams driver Lance Stroll. Stroll Sr has been critical of the Williams car this year, suggesting he’d look to move his son and his millions of sponsorship elsewhere if things didn’t improve. If he buys the team, it seems likely F1’s youngest ever podium finisher will be heading there. Ocon had been linked with the seat which went to Ricciardo at Renault, which suggested Perez would remain at Force India alongside Stroll. However, Perez posted a cryptic message on social media over the weekend, causing some to speculate he could be out of F1 at the end of the year, while this may also have been an attempt to attract interest from other teams by suggesting he’d be available to drive elsewhere. Ocon and Russell are both owned by Mercedes, who supply Force India’s engines. Ocon had an impressive first full season with the team, and has put in several strong performances again this year in a car that hasn’t always been on the pace, while Russell has tested with Force India. Ocon offers more experience that Russell, but if Ocon were to move elsewhere, it wouldn’t be a surprise to see Mercedes pushing to get their other junior driver a seat with the customer team. McLaren’s 2019 lineup is unlikely to fall into place until Fernando Alonso decides whether or not he plans to continue in F1. The two-time champion is currently dividing his time between F1 and the World Endurance Championship, including winning the 24 Hours of Le Mans earlier this year. Alonso now just needs victory at the Indy 500 to complete the Triple Crown of Motorsport, which has seen him linked with a move to IndyCar in 2019. Like Mercedes, McLaren also have the nice problem of a talented youngster performing well in F2. Lando Norris has excelled in his first season in the series, and is in contention to win the title. The team previously confirmed they’ve received three approaches from other teams about Norris, and his contract stipulates the team must offer him a race seat by October this year, or he’ll be free to leave. Norris could replace Stoffel Vandoorne, who is also out of contract at the end of 2018, and has been underwhelming in his two years as Alonso’s teammate. If Alonso does move on, McLaren will likely want another experienced driver coming in, particularly if they have a rookie like Norris in the other car. Ricciardo had been linked with the team, but Carlos Sainz could be an option for McLaren, particularly as he has experience with the Renault engine, which McLaren are using for the first time this year. Anything seems possible at McLaren though, with Kimi Raikkonen and Sergio Perez among those also touted as possible replacements for Alonso. Toro Rosso’s lineup is likely to be affected by Red Bull’s decision. If Red Bull want Gasly, they’ll need a replacement to drive alongside Brendon Hartley, who could also be replaced. Lando Norris was one of a number of drivers linked with the team earlier this season when the New Zealander was struggling, but the team have since backed Hartley to continue for the rest of the current campaign. Dan Ticktum is the most experienced member of Red Bull’s junior program, but the European Formula 3 driver needs to win his championship to get close to having enough superlicence points to step up to F1 next year. Sainz would also be available to return to Toro Rosso if Gasly is preferred to the Spaniard at Red Bull, but he may prefer to look elsewhere rather than return to his old team after being overlooked for the step up to the senior Red Bull team. Honda had previously expressed an interest in putting F2 drivers Tadasuke Makino and Nirei Fukuzumi in a Toro Rosso seat next year if either get enough superlicence points, but neither of the Japanese pair will be close enough this year. After a four-driver lineup last year and a new power unit supplier for 2018, continuity could be appealing for Toro Rosso, so expect at least one of Hartley and Gasly to remain. With Charles Leclerc in the car and Antonio Giovinazzi as the reserve driver, Sauber are Ferrari’s destination of choice for their young drivers. Haas boss Guenther Steiner previously revealed Ferrari asked him to give Giovinazzi a drive this year, but he preferred the more experienced duo of Grosjean and Magnussen. Ferrari have continued to give the Italian time in their tests, so would surely be keen to get him a seat in one of Ferrari’s customer teams. If Leclerc is promoted to Ferrari next year, Giovinazzi is the obvious ready-made replacement. Marcus Ericsson has admitted that he’s driving for his career this season after a disappointing couple of seasons, but the Swede has shown improvement, including an impressive drive in tricky conditions at Germany last month. If Leclerc does go to Ferrari, Raikkonen would be available to head in the opposite direction. Williams are one of the teams who depend on their drivers to bring in sponsorship funds, which seemingly makes Sergey Sirotkin and Lance Stroll’s seats safe for next year. However, it Stroll’s father ends up buying Force India and moving the Canadian there, a seat will be available at the team. 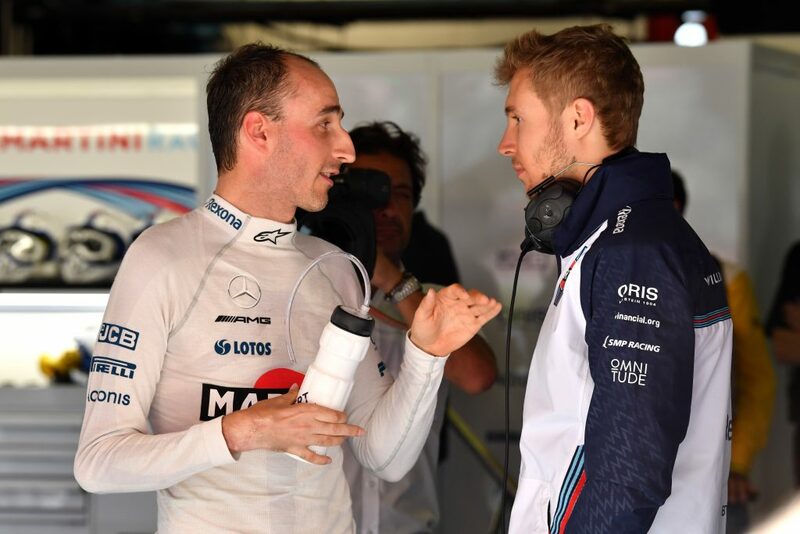 Robert Kubica, Williams Martini Racing, talks with Sergey Sirotkin, Williams Racing. When Sirotkin signed as Stroll’s teammate, Williams announced it was a multi-year deal for the Russian, which suggests he’ll be there next year too, although he’s yet to score any points this season. Robert Kubica could come into the team if either of the current drivers move on, having filled the role of test and reserve driver this year. However, Mercedes are the team’s engine supplier and are thought to be in talks with Williams over a gearbox deal, which could give them enough influence to put Russell in the car if there isn’t a seat at Force India. Kevin Magnussen is almost certain to continue at Haas next year after securing four top six finishes so far this season. Romain Grosjean has had an up and down season, finding himself involved in a series of clumsy incidents early in the campaign before turning things around with three points-scoring finishes in the last four races, including the team’s best ever finish of fourth at the Austrian Grand Prix. Given the uncertainty surrounding the team’s test and development driver Santino Ferrucci, who lost his F2 drive after deliberately crashing into his teammate, it’s unlikely Haas will be making any changes for 2019. However, Guenther Steiner recently insisted the team has taken phone calls from a number of driver about a seat for next year. One driver linked with the team is IndyCar and WEC driver Pietro Fittipaldi. The grandson of former F1 champion Emerson Fittipaldi was due to test for Haas earlier this year, but missed out after breaking both legs at the 6 Hours of Spa. Having only just returned from those injuries, it’s unlikely the team would take a punt on him in a race role in 2019, but he could join the team in a test or reserve role. Giovinazzi has also continued to be linked with the team, having tested with them in 2017.